When it comes to movies, there’s nothing that leaves me more contented than a good superhero film. It helps that we’re at a point where superhero movies are everywhere nowadays. However, where there are superheroes, there are also villains not far behind. This statement also applies to film, most particularly the movie, Venom. This is a movie I’ve been looking forward to seeing, mainly because of Venom’s association with Spider-Man, one of my favorite superheroes (who isn’t present in the movie, ironically). As you may or may not know, the movie’s titular main character is mainly known for his role as one of the main nemeses of Spider-Man. While this isn’t the first time Venom has appeared on the big screen, it is the first time he’s taken the role as the hero of the story (excluding the comics of course). What’s even more unusual is that Spider-Man is not a presence in the movie, leaving Venom without one of the main pillars to his character. This lack of the famed web-slinger is especially noticeable, and puzzling, when you remember that Venom’s existence is all thanks to the actions of Spider-Man. The movie compensates for this omission by slightly changing the backstory to fix Spider-Man’s absence. Despite this, the character of Venom seems capable of holding the role of main character very well for his first outing. It also helps that the special effects did an alright job of bringing the character to life, giving him the terrifying presence that he’s known for in the comics. This is especially made apparent whenever Venom is seen in action, whether maneuvering through the city or while in combat. Scenes like these, along with a few laughs, left the theater present for the movie satisfied with the overall viewing experience. However, while the movie has its high points, there are also a few low points worth mentioning. For starters, the overall pacing of the movie seems to be all over the place at times. Sometimes the pacing will be alright; then suddenly, it will speed up a bit too much at certain points, making it feel like the movie’s going by in a flash despite its 2-hour runtime. The story also suffers a bit due to the beginning half of the movie being a bit bland, which is also because of the presence of the “evil corporation up to no good” plotline. And while Venom’s final battle against the big bad was quite the spectacle, it was sort of ruined due to it taking place at night, while both characters were shades of black and grey, making it difficult to see what was happening at times. Overall, Venom was an okay attempt at bringing the comic book character into a movie where he served as the leading role. It had its flaws, but it managed to be an entertaining movie despite this. I just hope that these issues will be fixed if the studio plans to make a sequel. 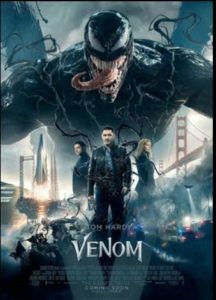 That said, if you’re a fan of superhero movies, or are just interested in seeing a movie in the superhero genre, then I would recommend seeing Venom. There’s not much harm in doing so, and you’ll surely get some enjoyment out of it.